20 cm xxiv, 276 p.
Epictetus, a Greek stoic and freed slave, ran a thriving philosophy school in Nicropolis in the early second century AD. His animated discussions were celebrated for their rhetorical wizardry and were written down by Arrian, his most famous pupil. Together with the Enchiridion, a manual of his main ideas, and the fragments collected here, The Discourses argue that happiness lies in learning to perceive exactly what is in our power to change and what is not, and in embracing our fate to live in harmony with god and nature. 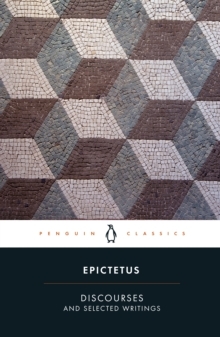 In this personal, practical guide to the ethics of stoicism and moral self-improvement, Epictetus tackles questions of freedom and imprisonment, illness and fear, family, friendship and love, and leaves an intriguing document of daily life in the classical world.